Last Thursday, the New York comedy group Improv Everywhere played a prank on all those walking through Grand Central Station. The 207 participants completely froze for a full five minutes. Take a look at the video below to see how people react. Sarah Silverman is currently cheating on Jimmy Kimmel with Matt Damon, and decides to compose a song with Damon to finally announce this to the world. 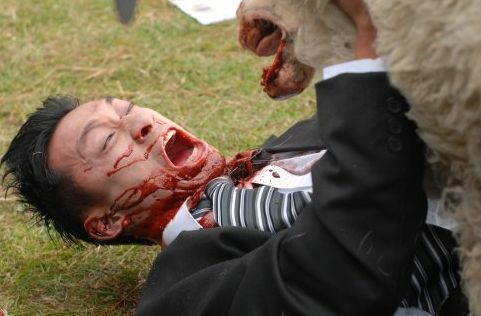 Yes, that is a sheep eating a man’s face. Courtesy of IMDB. Alright, the following prank video has nothing to do with college but if you have 40 seconds to spare between classes, you will surely enjoy yourself.